As an energy healer, the concept of grounding during energy healing sessions is crucial. Being grounded in that sense means that I am always aware of where I am, who I am and what is going on around me. This allows me to be calm and centered in dealing with whatever arises during the session and allows me to adequately hold a safe space for my client. I recently came across a film called “Down to Earth”, which goes into the more scientific side regarding the importance of grounding. Essentially, the short film discusses the fact that as humans we have a lot of inflammation in our body and inflammation, left untreated, ultimately leads to chronic pain. Fortunately for us, the experts in that film say that a very simple way to reduce this is to actually get grounded – i.e. walk with our bare feet on the ground. Why? Having our bare feet on the ground actually helps charge our body’s electrical circuit. If we think about it from that perspective, a lot of us spend a lot of our time ungrounded. We sleep in beds which are above the ground, some of us may sleep high in the sky in apartment buildings, and then we put on shoes and go to work/run/etc. 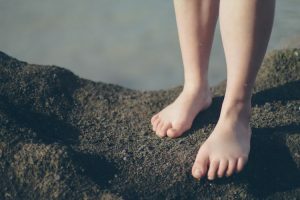 When was the last time you actually had your bare feet on the earth, water or sand? From a personal perspective, I was quite curious and decided to try this out. I had been suffering from some neck pain for a few hours. During my lunch break, I headed out to the Botanical Gardens, found a nice patch of grass under a huge tree, threw off my shoes and laid down on the grass. I was lying down for about 20 mins and as I was lying there I could feel my muscles beginning to relax, and my lower back was also beginning to make micro movements to adjust itself. When I stood up, I felt a lot lighter on my feet, refreshed and guess what – the neck pain was no longer present! You can check out the video here but from my perspective, if we can all get out onto the grass or the sand for at least 20 mins a day, then our body will thank us for it.